Welcome to Grand Rounds for May 10, 2011! Dr. Ed Pullen’s “Medical blog for the informed patient” is not thrilled about Vimovo, a new drug for osteoarthritis. Pullen believes in letting people know what’s going on behind the scenes. At the Health Business Blog, David Williams’ Rise of People Power, or Arrogance of the Academy? takes Nature to task – and rightly so – for publishing a commentary titled “The Rise of People Power” but hiding it behind a $32 paywall. (For a two page article!) It’s a good piece about the recent push by MS patients to pursue a new treatment; many in the establishment have been asking “Who are these people, just patients, trying to define our research priorities? ?” Who are they, indeed – just the ultimate stakeholder, with the most to lose. And that leads naturally into our theme – the future of health, which is indeed being increasingly defined by the ultimate stakeholder: the patient. It’s about time! This event took place April 4 in the Dutch city of Maastricht (Wikipedia), which is pronounced like “Ma’s strict,” except the c is clearing its throat. It’s a lovely town, way down at the southern end of the Netherlands, between Belgium and Germany. 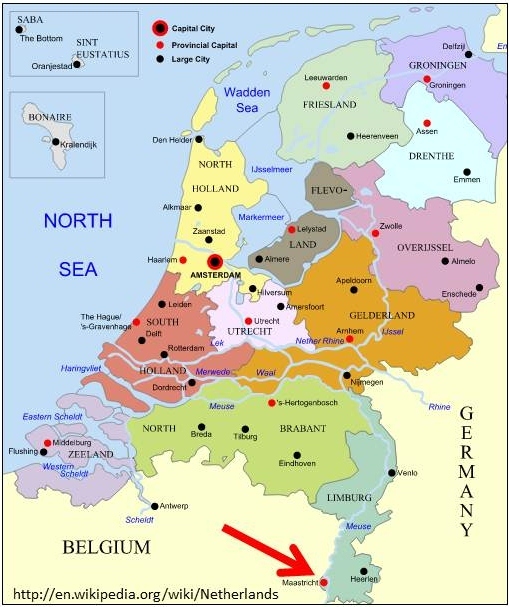 Wikipedia says there’s argument about whether Maastricht is the oldest town in the country. The people who live there say it is. :) It’s also where the Maastricht Treaty was signed in 1992, leading to the European Union and the euro. In any case, in the steepletop photo above (click to enlarge), there’s a big plaza. And across that plaza is the beautiful 900 seat theater that hosted TEDx Maastricht – a day packed with great speeches and a couple of energizing dance performances. Most people know about TED talks, at TED.com. TED talks are the Olympics of public speaking: you have nine or 18 minutes to blow people’s minds. (TED stands for technology, entertainment, and design, and the best TED talks combine all three.) Many people also know about TEDMED, the newer medical TED. Some of us from e-patients.net were at TEDMED 2010; our posts are linked from this one. TEDx is a newer, smaller, local, franchised version. 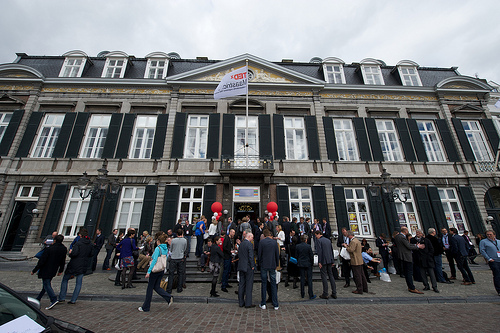 TEDx quality and event format aren’t as tightly controlled, but the one in Maastricht felt just like the real thing. Energy was high and execution was superb. The day showed that the future of health is indeed patient driven. Speech after speech showed the new role patients are playing, as they increasingly take the reins in healthcare, partnering with their clinicians and sometimes even defining the goals of their treatments. There were so many great talks that I’ve selected some personal highlights and categorized them. The entire set – all 20 of them, six hours of video – is on YouTube here. Regular readers know that I’m a big fan of the Society for Participatory Medicine, in which networked patients shift from being passive passengers to responsible drivers of their health. (Here are its blog and journal.) In Maastricht we got a boatload of evidence that people it’s a reality, and not just in the U.S. This powerhouse pulled herself out of the Dutch equivalent of a reform school and found purpose. She started ValidExpress, a postal express company for disabled customers. Check out her colleague who joins her near the end – paraplegic triathlete Maurice. “Am I disabled? No. I’m able.” Defining his life on his terms: that’s patient empowerment. It was a special privilege to hear from a couple of guys who get it and have hit it big on the big stage. In addition to Daniel Kraft, several other tech-oriented speakers tickled my fancy. On the “party pooper” side (his term! ), Bos is the Netherlands’ former Deputy Prime Minister and Finance Minister. He asks whether marvelous new technology will actually change the cost structure. His questions are valid, though I think he overlooks the solutions already being developed elsewhere. Lucien Engelen (@Zorg20) was the vision and driving force behind this patient-centered event. The patient aspect was so important to him that when the conference was first announced last year, the very first speaker named was a patient. That’s a great precedent for others to follow. The crowdsource trick is truly empowering ordinary people to improve emergency care: with this new app, when people notice an AED (defibrillator), they can upload its location – and then when someone needs an AED in a hurry, the app can tell them the closest one it knows. In true crowdsource fashion, the more people use it, the more valuable it becomes. That’s what they call the law of networks. His post about it is here. And that, ladies and gentlemen, is the future of health. Amazing stories! I will be back often as I go through them. Thanks for sharing. Fabulous GR, Dave. I missed the event, but am so glad you put this together. There’s a lot of serious information here, including the e-patient definition that I happened to be searching for today. And thanks for sharing the 1969 photo! Thanks so much for this wonderful summary of what seems like an amazing conference. Congrats on being asked to speak there! You say that you think that Bos has overlooked “the solutions already being developed elsewhere”. Could you say some more about that? The Netherlands and the UK both have relatively ‘socialised’ healthcare systems so I could understand his point of view and I thought it was a very real challenge to all those involved in decisions around healthcare, including patients. But I have seen very little discussion of it so I am particularly interested in your view. Thank you, Dave! Something here for everyone. DBS operation at Frenchy Hospital in Bristol By Professor Gill your programs on the net are wonderfull and i have been showing them to anyone who cares to see them.